We're happy to announce the latest version of BinTube Usenet Reader. In this update we've integrated features from BinTube Accelerator directly into the newsreader. This means that you no longer need to have both programs running to use the flexible download speed limiting and scheduling features provided by BinTube Accelerator. 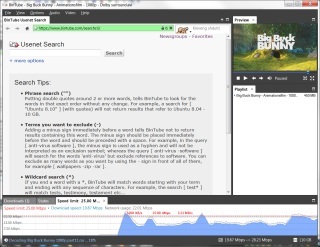 BinTube Accelerator is still useful for users of third-party Usenet clients, especially header based clients. But if BinTube Usenet Reader is the only client you use, you should uninstall BinTube Accelerator. Another small feature that was added is the option to disable automatic display of text files which can sometimes get in the way of your searching activities. The latest versions and change logs of the software are available the downloads page.